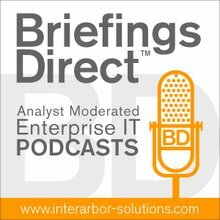 Gardner: We have a fascinating show today, because we are going to learn about how a prominent European IT-enabled business services provider, Steria, is leveraging cloud services to manage complexity and deliver better services to customers. Gardner: With that, let’s move on to our guest. He's been a leading edge adopter for improving IT service delivery for many years, most recently as the IT Service Management (ITSM) Solution Manager at Steria, based near Paris. Please join me in welcoming Jean-Michel Gatelais. Gatelais: Thank you very much. At Steria, I'm in charge of the Central ITSM Solution we provide for our customers, and I am in-charge of the Global ITSM Program Roadmap, including the ongoing integration from ServiceCenter 6 to Service Manager 9. I'm also responsible for the quality of service that we deliver with this solution, and of the transition of new customers on this platform. Steria is an IT service provider. We are about a little more than 40 years old. Our business is mainly in system integration, application management, business process outsourcing, and infrastructure management services. We have big customers in all sectors of industry and services, such as public sector, banking, industry, telecom, and so on. We have customers both in France and UK mainly, but in the whole of Europe also. For example, we have British Telecom, Orange, and the public sector in the UK, with police, etc. Gardner: What’s different now about IT service delivery than just say few years ago? Muller: We see almost a contradiction within enterprise users of cloud. We see groups that will quite readily go out and adopt cloud services. The so-called consumerization trend is quite prevalent, especially with what I would describe as simple services. For example, office automation tools, collaboration tools, etc. In other words, if they can’t see it or touch it, they're reluctant to relinquish control. The most fascinating part for me is that you can often find those two behaviors inside the very same organization. Sometimes, the same person can have diametrically opposed views about the respective merits of those two approaches. Gardner: Are you selling and delivering cloud services to the IT department or others? Maybe we could call that shadow IT, Jean-Michel? In fact, what we're trying to do is to standardize, as much as possible, the basic offering we propose. On top of that, we have additional requests from our customers. Then, we try to adapt our offering to the specific request. We see this platform as a service-enabler, both service-support platform and the service-enabler, because we use it to manage and activate the services we propose to our customer, including cloud services, security services, and our new offering, Workplace On Command services. Muller: When a customer thinks about taking services that maybe they used to run internally and moving those services to Steria, how important is it for them to maintain visibility and control, as they are thinking about moving to cloud? We provide the KPIs that are published for the service offering. This will include such information as service availability rates, outage problems, change management, and also activity reporting. Gardner: Do you have any examples? Muller: The interesting part is that the development and test process is such a resource-intensive process, while you are in the middle of that process. But the minute you are done with it, you go from being almost 100 percent busy and consuming 100 percent of the resources, to, in some cases, doing nothing, as Jean-Michel said, for months, possibly, even years, depending on the nature of the project. Gardner: What do you advise others who would be pursuing a similar objective? Muller: Right now, I've got a couple of metrics, a couple of KPIs, that matter to me really deeply. From your perspective, are there one or two KPIs that you're looking at at the moment that either make you really happy or that are a cause for concern for you, as you think about business and delivering your services. What are the KPIs that matter to you? It may be basic, but you should take the configuration management process. That is very important, even in cloud offerings. It's very difficult to make evident that if you do some configuration management, you will have higher a ROI than if you don’t do it. Today, even internally in Steria, it's much more difficult to get approval to develop and to improve configuration management, because people don’t see the interest, as you don’t sell it directly. It's just a medium to improve your service. Gardner: You're really starting to put in place the mechanisms for determining quite distinctly what the payoffs are from investments in IT at that critical business payoff level. So I think that’s a very interesting development in the market. Gardner: Our audience can carry on this dialogue with Paul Muller through the Discover Performance Group on LinkedIn.